After months of work—but still ahead of schedule—the City of Avondale Estates completed stabilizing and repairing its historic western gateway monument, Carl’s Corner. In March 2014, the City announced it received a $9,270 grant for Carl’s Corner improvements from the Historic Preservation Fund, administered by the Historic Preservation Division of the Georgia Department of Natural Resources. The grant covered 60 percent of the work on the structure. 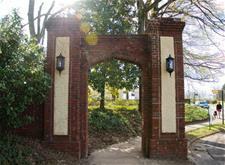 The 1920s-constructed red brick and stucco ceremonial entrance archway, named after an early Avondale Estates gardener, is located at the corner of South Avondale and North Avondale roads. It was referenced in 1986 as a contributing feature to the National Register of Historic Places District. It’s a highly visible, meaningful monument, and its restoration will leave a more positive, lasting impression on residents and visitors. Residents interested in maintaining the historic features of the City expressed concern over the condition of the archway, and an interest in telling its story. Letters of support from local residents, boards and commissions and the DeKalb History Center helped secure the grant money for this project. Carl’s Corner is now good as new and will be preserved for many years to come.